I spent the Sunday of Memorial Day Weekend cleaning up my study. This is something I do just once ever three or four years (or roughly twice as often as my 2nd-least-favorite chore, cleaning the garage). As I was organizing the files, I came across this picture. I have a number of military men in my family tree. My family research is thick with the military files of my Grandpa Dittes, who was an Army MD in Australia & New Zealand during World War II. I have the flag that draped my Grandpa Mooney's casket when he died in 1981, recognizing his service in the Navy during World War I.
I also have this postcard--a link to an army man about whom I know very little. The postcard is addressed: Familie Gotthold Dittes, Delikatessen Geschaeft, Broklyn (sic) New York, Amerika. It's amazing, the spare address. My great-grandfather, Gotthold Dittes, indeed owned a grocery story in a German section of Brooklyn. His wife, Anna Katherine Funk Dittes, was a cook who ran the deli. It is signed, "Schwager und Brueder," leaving me with no certain first name. I know his last name, of course. 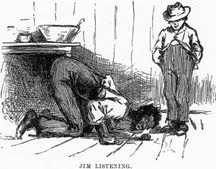 The man in this picture is my great-great uncle. His last name, like my great-grandmother's, was Funk. He was one of 10,000 young men from the city of Ulm to sign up for the imperial German Army during the opening years of the Great War. I read the card closer. It is difficult because of Fraktur, the German form of cursive that makes some of the letters quite difficult to make out. I'll try my best. "Muensingen, 6/6 1915." Muensingen was the site of the Duke Albrecht Barracks, a training site for soldiers ready to ship off to the Front. During a break from training, my great-great uncle had gone to a photo studio to have this card made. Observe his well-groomed mustache--I doubt it looked so nice once he made it to the trenches. His uniform is crisply pressed, his bolt-action rifle looks ready. Does he look fierce? Not to me, he doesn't. I can make out little else from his note. 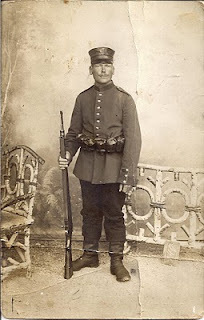 He wants my great-grandparents to see his picture as a soldier "bild als Soldat." I find the word, "family." My German isn't good enough to read the whole note, much less peer between the lines at his thoughts. In 1915, the war still seemed winnable for all sides. There had been heavy casualties, but the bloodbath of 1916 was still in the future. Here in the States, my grandparents were still speaking German in their deli and in their home. Gotthold had arrived just ten years earlier, Anna had come in 1901. My grandpa was just three years old. Perhaps it's because it's Memorial Day, but I wonder how the war went for my great-great uncle. 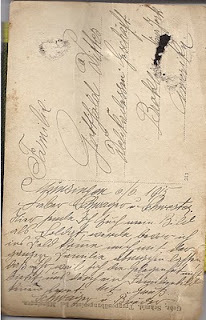 My cousin, Frank, has told me that my great-grandmother exchanged letters with family throughout the war--or at least until the United States entered the war against Germany (I'm sure familial communications were hampered by this fact). He has told me that Anna's three brothers served in the German Army and that all three survived. While Memorial Day is an American celebration, this picture brings me to another conclusion. It makes me think of the soldiers on all sides of a given conflict. Their shared concerns for families and loved ones behind the lines. It makes me glad to have grown up in a family with a unique perspective on the two greatest conflicts of the 20th Century--whose deep ties bridged the gaps erected by emperors, generals and dictators.